Wiring sold for electrical projects often carries labeling to help you choose the right product for your needs. Letters, numbers, and wording on wiring labels tell you important information, such as the wire material, the size of the wire, and the type of insulation used on the conducting wires. Labels are found on both on individual insulated wires and on insulated cable containing bundles of wires. Cables carry labels indicating the cable type or construction as well as the number of wires inside the cable. The most common type of wiring used in homes is non-metallic (NM) cable, commonly called "Romex," after the popular brand name. New NM cable contains two or more insulated conducting wires and usually a bare ground wire. The wires may be wrapped in paper, and all of the wires are encased in a flexible plastic jacket, or sheathing. The labels on the outer sheathing of NM cable indicate the size (gauge) of the individual conducting wires, the wire material, the number of wires contained inside the cable, the maximum voltage rating, and whether there is a ground wire present. The wire size and number of wires are indicated with numbers. A ground wire is indicated by "G," "w/G," or "with Ground." The wire material is indicated by "CU" for copper and "AL" for aluminum. 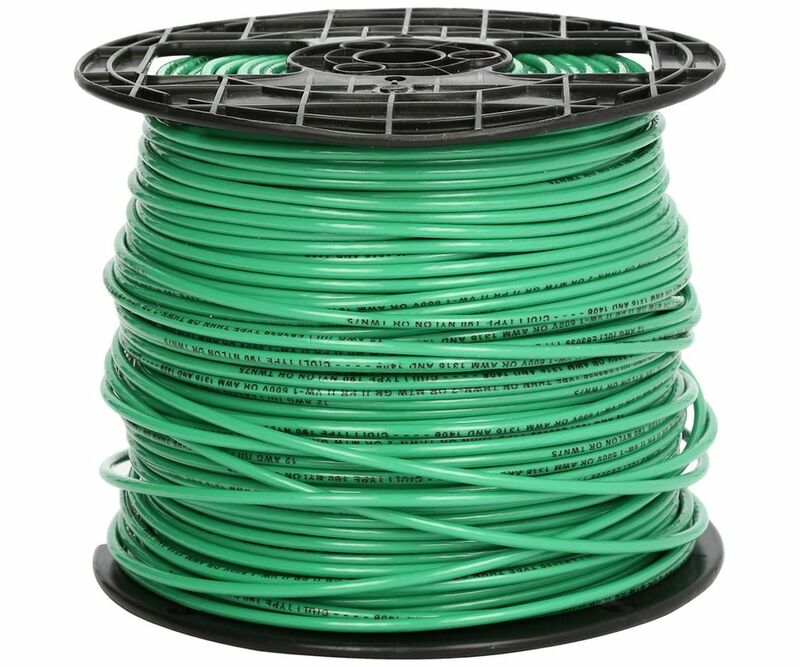 14-2G: Cable contains two insulated wires plus a ground wire; the wires are 14-gauge. 14-3G: Cable contains three insulated wires plus a ground wire; the wires are 14-gauge. 12-2 w/G: Cable contains two insulated wires plus a ground wire; the wires are 12-gauge. 12-3 w/G: Cable contains three insulated wires plus a ground wire; the wires are 12-gauge. 600 V: Cable is rated for a maximum of 600 volts; this is standard for residential NM cable. TYPE NM-B: Non-metallic type-B cable; this is the current standard for residential installations. "NM-B" cable is more heat-resistant than older "NM" cable. Most NM cable is used in "dry," or interior, locations, where the cable is protected inside wall, ceiling, and floor cavities. Underground feeder (UF) cable is a special type of non-metallic cable that is suitable for "wet" locations and for direct burial in the ground. UF cable is usually gray (not white, yellow, orange, or black, like standard NM cable); it is labeled "UF-B" and may include "Sunlight Resistant" or similar wording. UF cable uses the same symbols as standard NM cable to indicate the number and gauge of wires. Individual insulated wires are used in home wiring when an installation calls for conduit—a rigid or flexible protective pipe or tubing through which the wires are run. Electricians buy the individual conducting wire by the spool so they can pull different wire from different spools as needed. H: Heat-resistant; able to withstand temperatures up to 167 F.
HH: Highly heat-resistant; able to withstand temperatures up to 194 F.
Wire size: Indicated by a number (such as 12, for 12-gauge) or a number followed by "AWG," for American Wire Gauge. Number of wires: Usually indicated by the number 2; landscape wiring typically has two insulated wires stuck together (similar to a lamp cord) and contains no ground wire. Properties: Wording indicating sunlight-resistance or suitability for underground installation.